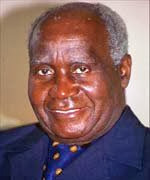 Former first Lady and first republican President Dr Kenneth Kaunda's wife Betty has died. Dr Kaunda's first born son Colonel Panji Kaunda has confirmed the death of his mother to QFM News this morning. Colonel Kaunda who is also communication,transport, works and supply deputy Minister says Mama Betty died in a Harare hospital in the early hours of this morning.